Recently I have started a very interesting project and part of the project is to be able to display .pdf and .doc files in a flex application. For the pdf I had luck finding this great tool FlexPaper. The idea behind it was to convert the pdf to swf using PDF2SWF from SWFTools so for every page of the PDF document you had a frame in the swf. FlexPaper does a great job for viewing .pdf documents, but what about .doc? Well I guess the solution had to be pretty much the same – convert the doc to swf and display it with FlexPaper. Unfortunately I could not find any good doc to swf converter. So I asked myself why not just convert the Word document to Adobe Reader document and then do the same what I am doing for .pdf documents (convert them to .swf and view them with FlexPaper). That seemed like the straight-forward solution. 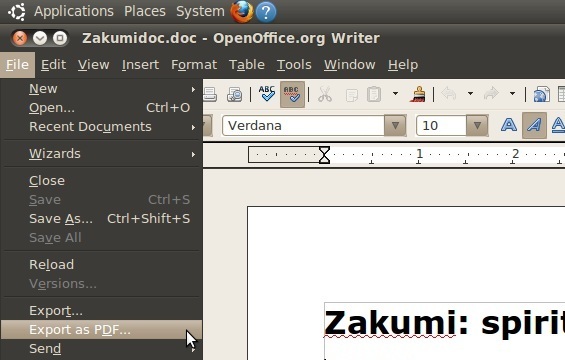 Converting .doc to .pdf (and other various formats) is really easy with OpenOffice and it comes for Windows, Linux and Mac OS. When you open your document you just have to click File and Export as PDF. However if you want to make this process programmatically in a headless mode here is the solution. There is this Java library called JODConverter that relies on OpenOffice that comes here for the help. This is my workaround for viewing Word Documents with Flex, maybe you have a better solution? I’d love to hear it. Last I wrote how to connect Flex with Spring. Now I have decided to create an example of uploading multiple files via BlazeDS and here I will show it to you. So in the example we have 2 buttons (browse and upload) and a data grid that will display the selected files. When the first button is clicked we call the browseFiles function that creates an instance of FileReferenceList and opens up the file dialog for browsing. Now we should be able to see our data grid filled with names of files. 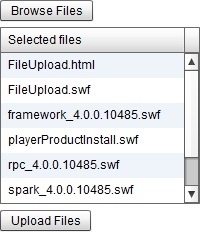 The next thing to do is to create a function for handling the click of the “Upload Files” button. For each FileRefernce we call our remote method by passing the file’s name and the file’s data represented by BytesArray. The doUpload method just creates the directories to the File_Path, creates a new output stream for the given file and writes the bytes. This won’t be a post about how to integrate Flex and Spring. Actually I intended to be one, but several days ago James Ward posted this tutorial on how easy it is to do with Flash Builder 4 so I thought it won’t be necessary. What I will show is how to upload our project to a free Java and Tomcat host to test it, connect our Flex application to it and show this example here. I’ve been looking for such free hosting and the only thing I’ve found (if there are any others please comment) is eatj.com that provides a free trial limited up to 50 MBs of storage and every 6 hours the server is restarted, but for testing is fine. I assume that you already created your Spring project based on the tutorial. I’ve added small changes for the current example, if you want the source of the example get it from here. Now right click on the project -> Export -> WAR file and select where to export it. Now we log into our account in eatj.com and upload the war file, restart the server and this is it. So now we compile it and we have our swf. 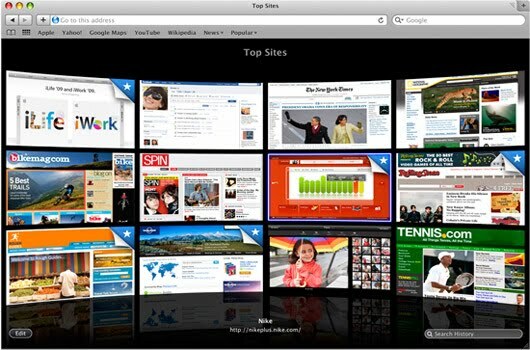 For this example I will upload it to http://sites.google.com/ which I use to publish my files to. There is one last thing to do, to create and configure a crossdomain.xml on our server. 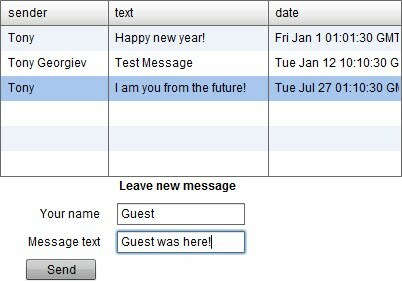 Now with your favorite ftp client, connect it to host: s215.eatj.com port:21 your account’s username and password. Navigate to /webapps/ROOT and copy the crossdomain.xml there.